Hello festival season, I don't know about you but when it comes to this time of year I like to pretend i'm at Coachella living it up with Vanessa Hudgens. Alas, i'm not. So what better way for me to imagine i'm there by creating two easy festival dos you can do in 2 minutes! They're both easy-peasy so if you're stuck for a hair-do in the middle of glastonbury then these two will be your new bffs. Step 1). This is a french braid so if you know how to do it you've got it! If not..take three sections of your hair and wrap the right section over the middle. Repeat with the left side and wrap this over the middle too. - Like a criss-cross. Step 2). Repeat step one, but this time add more hair to each section. Grab the right section and cross this over, followed by the left section again. Step 3). Continue this all the down, it should look something like photo 7. Step 4). 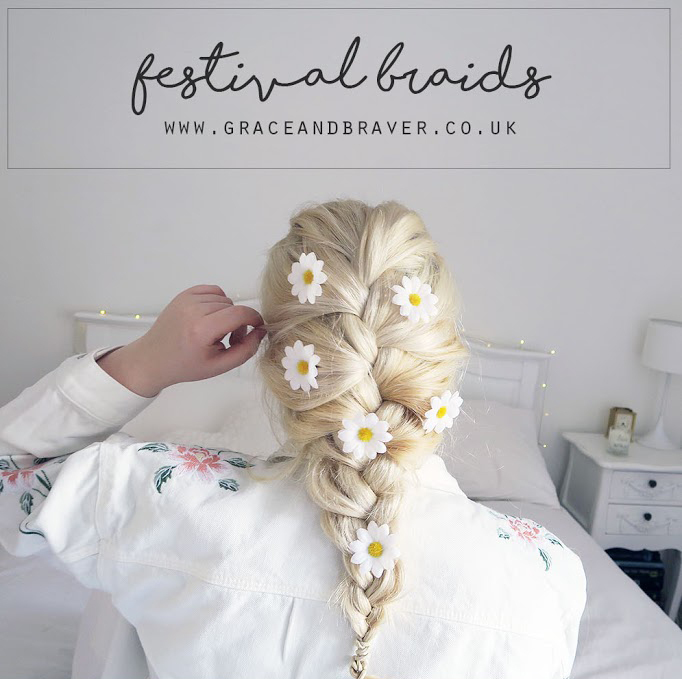 Secure the braid with an elastic and here's the fun bit, starting from the top to the bottom pull out and tease the plait outwards. The messier the better. Step 5). My favourite part, to give it that extra festival vibe, i'm adding a few felt daises, i bought mine from amazon for £3. To make them extra secure I added bobby pins to the bottom and clipped them in. Ta-da! You're done. Step 1). 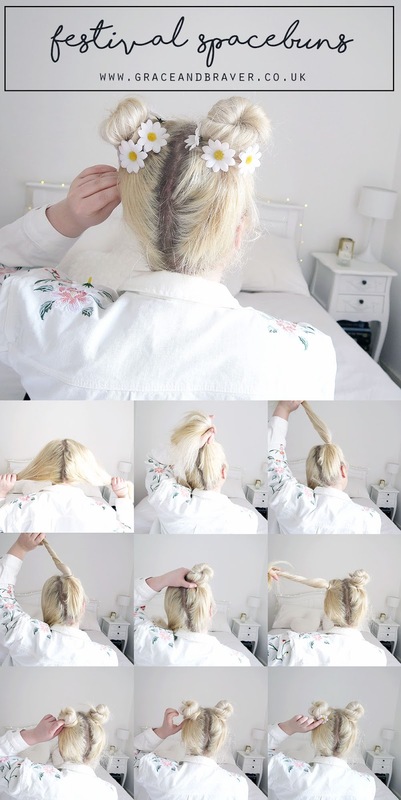 Split your hair into two and tie one side to get it out the way. Don't worry it doesn't have to be perfect. Step 2). Tie one side up into a pigtail, you'll be feeling very Baby Spice Circa 1999. Step 3). Twist this pigtail and wrap it around the hair elastic - creating the bun. Pin this in place, don't worry if you can see the bobby pins. Step 4). Repeat this on the other side. Now you've got your space buns!!! YAS! Step 5). This step is optional, but I pinned the felt daisies all around the buns to get that Coachella look. And that's it, the two easiest hair tutorials you can use this summer. It's so lovely to see your blog posts again! I actually wrote a blog post ideas post today & 1 of the ideas was a hair tutorial post as I hadn't seen one in so long! I love these 2 tutorials so thank-you for sharing lovely! I've always struggled with doing french plaits so hopefully this tutorial will help me out.. i love the look of space buns as well! I have major hair envy every time I see your pics on Instagram!! I wish I could do my hair like this cause it looks amazing!